I stumbled across the "time to make the doughnuts" challenge on Tartelette last week and thought to myself what a wonderful idea. This is the perfect excuse to make a fried dessert. We eat a lot of dessert in our house; so I try my best to keep them as healthy as possible. Up until now I haven't been able to justify adding "fried sweets" to the rotation. 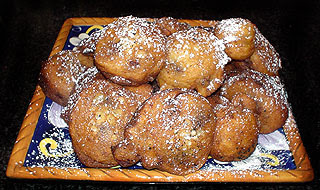 I found a recipe for Lemon Ricotts Fritters in Gina DePalma's, Dolce Italiano. (I love this cookbook) These Italian doughnuts were simple to make and absolutely delicious to eat. My husband and I ate half the batch on Saturday. I'm almost glad I had a tooth pulled tonight or I'd be tempted to finish off the rest of them. Lemon Ricotta Fritters 1 cup flour 3/4 cup sugar 1/2 cup coarsely crushed amaretti crumbs 1 1/2 tsp baking powder 1/2 tsp salt 1/4 tsp grated nutmeg 1 1/2 cups whole milk ricotta finely grated zest of 1 medium lemon 2 large eggs 1 Tbls dark rum 1 tsp vanilla extract 1/2 cup finely chopped semisweet chocolate olive oil for frying confectioner's sugar for dusting In a medium bowl stir together the flour, sugar, amaretti crumbs, baking powder, salt and nutmeg until thoroughly combined. Place the ricotta and lemon zest in another bowl. In a small bowl, use a fork and beat the eggs lightly with the rum and vanilla. Add the egg mixture to the ricotta mixture and whisk to combine them well. Add the dry ingredients and the chocolate and use a fork to mix all ingredients together thoroughly. Do not over mix; a few lumps of ricotta are fine. Heat about 2 inches of oil in a large heavy saucepan until it reaches 360 degrees. Working in batches, drop the batter by heaping teaspoonfuls into the oil and fry them until they are deep golden on both sides. Use a skimmer to remove them and drain them on paper towels. Serve warm with a dusting of powdered sugar. Makes about 15. These look incredible, and have three things that I love: ricotta, lemon, and amaretti. I just found your blog via Tartelette - it's lovely! Oh wow, what an awesome combination of flavors in your fritters. This sounds like a fried lemon cheesecake with chocolate and that is not something I could easily resist! Yum! we make ours with raisins instead of chocolate chips.. you should try it sometime you will love them! 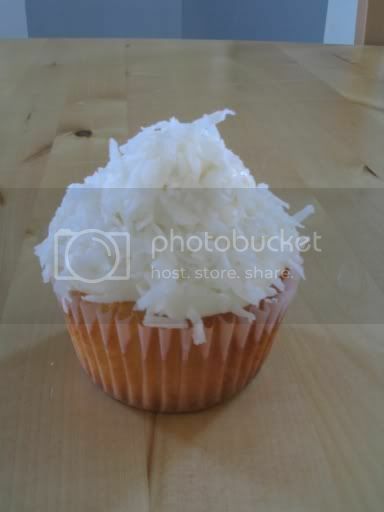 love this blog... mmm wish i could bake/cook like you!